Mekong River Tributaries: That's My World! These old trees line the road in front of Hor Pra Keo, a former Buddhist temple which is now a museum. I took this picture on Tuesday while walking to the bank. Along with the tree-lined streets and the history of the roads and the old French buildings, Vientiane has a distinct feel! In the heat of Laos it must be lovely to have a shady walkway under those big trees. I wonder why they are all painted white at the base, maybe because of the Buddhist temple or just to make them more prominent and not be run into by vehicles? We once had a long discussion about this with Lao friends. I wondered if this had an effect on bark-eating bugs or if it had a religious significance. 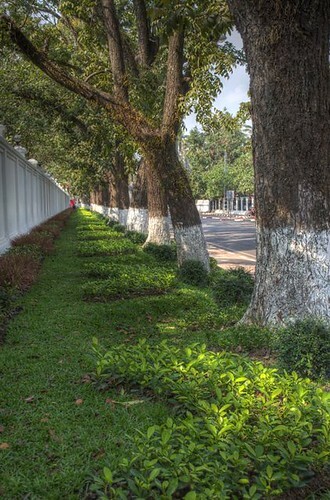 In fact, many trees in towns are painted white at their bases in Vietnam and Cambodia. My friends said that because there are so few street lamps, the white paint is more reflective during the night, so if the drivers have their lights on, they won't run into the trees. I don't think it has much effect if drivers don't have their headlights on. Lovely refreshing greenery, Interesting painting the trees white though! Thanks for sharing your world & photo.Interesting post,keep em coming,thanks again & do have a nice day. 2010 recommendations: Just be the Best I can be! The Worst Books of the Decade! The best Books of the Decade!